Statement of the problem. For increasing the level of living of the population and improving the stabilization in economy it is planned to increase grain export. To achieve the strategic goals a number of activities is envisaged, in particular, the use of grain varieties that provide high return on investment resources. 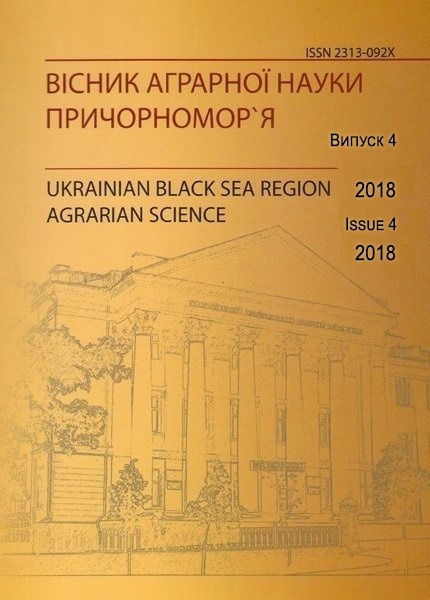 The aim of this work was to study the condition of grain production in Ukraine and to define the productivity recommended for the cultivation of winter wheat. Presentation of the basic material. According to the Main Department of Statistics in Ukraine, in 2016 it was harvested 66.1 million tons of grain and leguminous crops, including winter wheat – 25.32 million tons, the yield of which was 4.61 and 4.22 t/ha, and by the plan for 2020 provides increasing in grain production up to 80 million tons, whereas in 1990 it was produced 51.0 million tones. It is planned to increase grain yield of wheat to 4.94 t/ha. On the fields of the State Institution at “Nikolaev state agricultural experimental station of the Institute of irrigated agriculture NAAS” a research work was conducted on formation of productivity of winter wheat varieties. It has been established that the productivity of the varieties significantly depends on weather conditions, especially for plants with provided moisture during critical periods of their development. In 2016 maximum yield was formed by Konka variety, Odessa Niva (4.5 t/ha), Lytanovka, Zhavoronok (4.4 t/ha). The indicator results exceeded the yield of dry 2015 year for 24.3%, 21.3%, 13.7%, 23.2% according to the names. The lowest yield was obtained by cultivation of semi-dwarf variety Ovidiy (3.6 t/ha), a decrease was for 5.0% in 2015. On average for two years of variety testing, the highest grain yield was obtained during the cultivation of wheat varieties of Odessa Schedrost’ (4.23 t/ha), the Odessa Moodrost’ (4.03 t/ha). Conclusion. The use of winter wheat varieties (Litanovka, Vygoda, Odessa Istina, Odessa Schedrost’, Odessa Mudrost’, Conka, Lubimaya, Rosinka) that are adapted to arid conditions, will determine the increase of grain production and will promote the implementation of certain conditions inf agricultural development strategy of our country. Key words: grain production, winter wheat, weather conditions, cultivar, yield. Introduction. In modern conditions the issues environmental safety require in-depth analysis of economic, environmental and social aspects. The complexity of this assessment is to facilitate the production process to achieve the best results. The aim of the study is to prove the necessity the to introduce the number of indicators of economic efficiency of cultivation of perennial grasses of cash equivalents of increase in soil fertility and accumulation of biological nitrogen in the soil. The results of the research. The state of development of production of perennial grasses on farms in the South of Ukraine are analyzed. Installed violation and even the absence of science-based crop rotations. 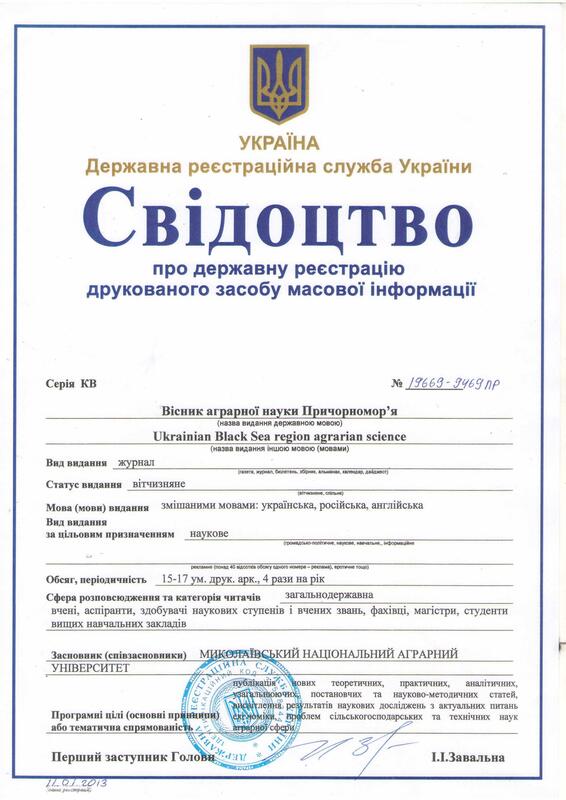 It is established that in the conditions of uncontrolled of production violation of these standards is observed. Business of farmers is oriented towards the production of more profitable technical crops comparing to perennial grasses. At the same time, the share of areas of perennial grasses for hay and green fodder still remains very low (1-2% at the rate of 8-10% in the rotation) in the structure of total sown area in the South of Ukraine. This also affects the deterioration of soil fertility. Every year due to the lack acreage under perennial leguminous grasses, such as alfalfa and sainfoin the loss of organic nitrogen, is increase, which could be accumulated in the soil, thereby reducing the use of chemical nitrogen fertilizers when growing following for perennial grasses in the rotation of crops. The characteristic of perennial legumes to fix nitrogen in the soil can make it to be considered as a specific form of its product and to transform its natural accumulation in cash due to certain criteria. It is advisable to add cash of equivalents increase of soil fertility economic indicators of determining of production efficiency of perennial leguminous grasses. The aim of these indicators is to assess accumulated humus and synthesized nitrogen in the soil after the use of perennial grasses. When calculating these indicators the significant factors are the price of manure, as the actual material prerequisite for the formation of humus, the price of nitrogen fertilizers and also crop productivity, which accumulates nitrogen and humus. In addition, the author proposes to apply correction factors, which vary depending on the climatic zone in which perennial fodder legumes herbs are grown.